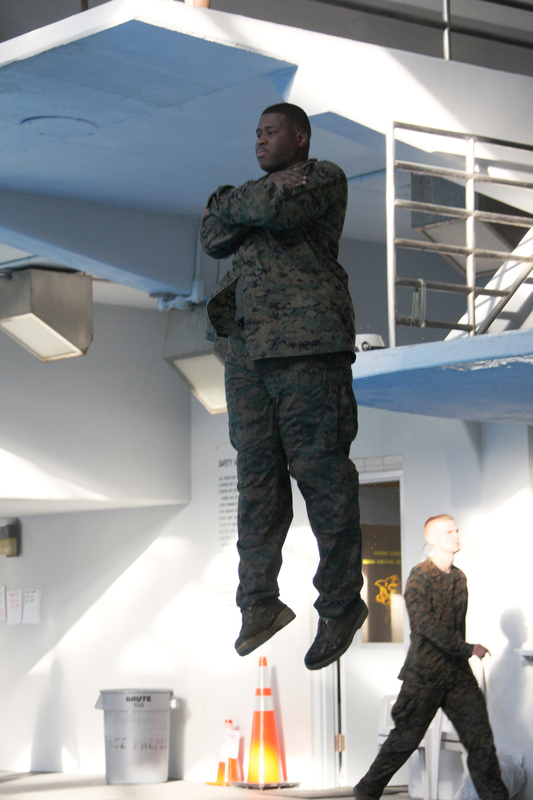 MARINE CORPS BASE CAMP LEJEUNE, N.C. – Staff Sergeant Sylvester McKinney, the data chief with the 22nd Marine Expeditionary Unit and Saint Louis native, leaps from the diving platform during water survival training aboard Camp Johnson, N.C., Jan. 20, 2011. This water survival test is the first time the command element conducted the new water survival qualification course. The 22nd MEU is a multi-mission capable force of 2,200 Marines and sailors and comprised of Aviation Combat Element, Marine Medium Tilt Rotor Squadron 263 (Reinforced); Logistics Combat Element, Combat Logistics Battalion 22; Ground Combat Element, Battalion Landing Team, 2nd Battalion, 2nd Marine Regiment; and its command element.